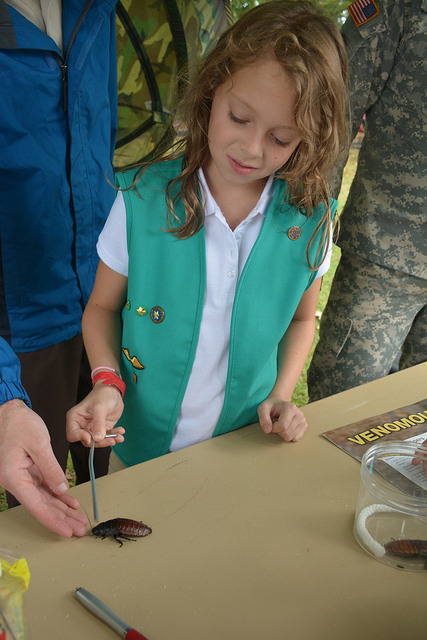 More than 500 Cub Scouts, Boy Scouts, and Girl Scouts from surrounding states gathered at Shore Park on APG North (Aberdeen) for the fifth annual STEM in Scouting Day, Sept. 12. 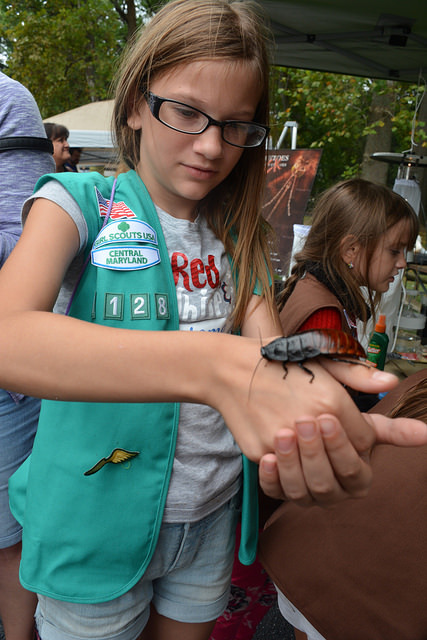 This year’s event marked the first time STEM in Scouting Day was open to all local Girl Scout troops. Volunteers from Team APG, the Baltimore Area Council of Boy Scouts of America and Girl Scout troops partnered together to organize the STEM-focused event. Baltimore Area Council STEM committee representative Marcie Forester said since this event began in 2010, almost 2,500 scouts have participated. “APG has given us wonderful support all five years,” she said. “This is a wonderful partnership because APG is an excellent technology center.” During the opening ceremony, Jyuji D. Hewitt, deputy director for the U.S. Army Research, Development and Engineering Command, challenged the scouts to use this opportunity to network and learn about STEM careers. He added that he is glad the event is now open to Girl Scouts. In the morning, scouts worked toward earning merit badges or participated in interactive STEM activities. Merit badges included aviation, architecture, chemistry, nuclear science, engineering, astronomy, automotive, geocaching, insect study, space exploration, medicine, robotics and weather. To assist with the event, about 10 Navy midshipmen Eagle Scouts from the U.S. Naval Academy in Annapolis served as volunteer instructors. Eleven-year olds Caroline Hufnagel and Allie Toohey, with Girl Scout Troop 2526 from Lutherville, said they enjoyed learning more about computer design and robotics by creating a banana keyboard using a Makey Makey invention kit, which includes a USB cable, alligator clips and connector wires. “I was never into robotics before, but now I really like it,” Toohey said. During lunch, the Girl Scouts listened to a Women in STEM Luncheon Panel. Participants included Suzanne Miclchling, the technical director of the U.S. Army Materiel Systems Analysis Activity (AMSAA); Deputy Program Executive Officer Mary Woods, with the Program Executive Office Command, Control, Communications-Tactical (PEO-C3T); Nina Lamba, a senior program manager with the BioMaryland Center, Maryland Dept. of Business and Economic Development; Navy Midshipman Monique Valliere, a Girl Scout Gold Award recipient; and Andrea Marsh, with Battelle. Panel participants said education is the key to a successful career. Parent Miriam Killoran, with Troop 361 from Ellicott City, called the event “wonderful.” She said her son, Zeb, is working on a signs, signals and codes merit badge. “This is a way for them to explore different avenues and different interests in an informal setting,” she said. “They see adults who are engaged in these [STEM] careers and are serving as mentors. It opens up so many ideas to them.” Troop 1128 Leader Laura Crum, from Aberdeen, called the event “a good time.” “They were all very excited to come here today,” she said. “Some girls don’t have the opportunity to do activities like this in school.” View more photos of the STEM in Scouting Day at www.flickr.com/ photos/usagapg.